He was born in the Bahmadli village of Zagatala region on the 22nd of June 1975. In 1992 he finished high school in his native village. He was engaged in Agricultural labor for some time. On the 2nd of July, 1993, he was called for the military service by Zagatala region Military Commissariat. He was serving in a special military unit # 776. The trainings were hard…and the front… He was involved in bloody battles for Agdam, Fuzuli, Tartar. In one fierce fight he was injured his leg. He was treated in hospital, and soon returned to the combat zone again. After the declaration of ceasefire, their battalion was sent to the previous place. On the 17th of March 1995.the battalion where he served was involved in preventing a coup attempt. As all his comrades, he was also hoping that there would not be bloodshed. But unfortunately, it was not possible. The blood of brothers was shed. A lot of people died in this battle against their own brothers. One of the fighters that gave his life for the country was Amirov. 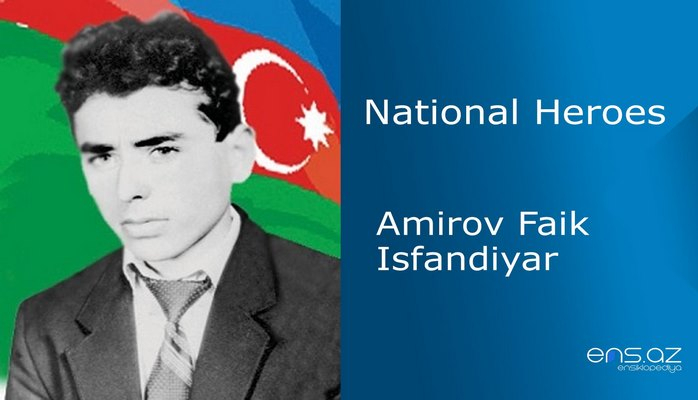 Faik Amirov was posthumously awarded the title of "National Hero of Azerbaijan" by the decree № 307 of the president of the Azerbaijan Republic on the 4th of April, 1995. One of the big highways in Zagatala city is named after our hero.